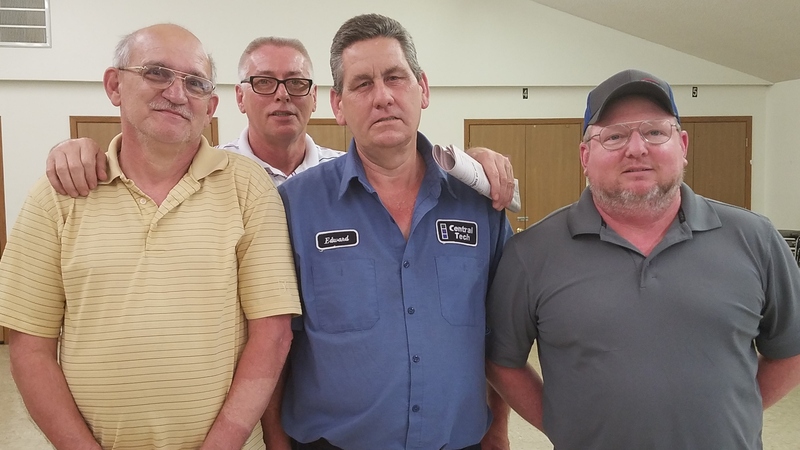 The regular meeting of the Town Trustees took place on Tuesday night, April 9th, as the electorally unseated Trustees (Larry Bussett, Mayor Jim Vogt, and retiring Marcia Jones) presided over their last official meeting. The newly elected officials will take office on Tuesday, May 14, at the regularly scheduled monthly meeting. One of the reasons for the delay is that Michelle Kelly (current Trustee) and Terry Voss are tied with 40 votes each. An official drawing for the winner will take place at the Election Board in Sapulpa on April 15th, 2019. Ed Pruitt, who previously was on the board 3 years ago, was reelected. He is a maintenance man at Central Tech, works as a night manager at Sahoma Lanes, and is an outreach pastor for Church of the Word in Kellyville. In his free time, he will sitting on the Kellyville Trustee Board, and looks forward to bringing “professionalism” to the board. Bobby McGarrah unseated him in the previous election, and then fought long and hard to keep his seat. Terry Voss hopes to be able to work “for the people of Kellyville” with the other leaders who were elected to the Board of Trustees. (Michelle Kelly was absent from the meeting). Russ Howard was elected as well. John Taylor is another trustee who was elected, and looks forward to “changes” in personnel, and working with the others “as professionals, not personalities, for the good of the town.” John is a former police officer with the Kellyville PD, who moved last year to the Maintenance Department, and went to the Trustees to help him get Holiday Pay he felt was due him from the PD. He was ultimately awarded his pay. Now, he will be in a position to help others. “For now,” quipped another one. The Current Business during the meeting was from Steve Boettcher, who gave a presentation to the Trustees concerning the Deadline of May 1st for an INCOG Grant. Last year, the town applied for this same Grant (for water, sanitary sewer, water towers, and other water-related purposes) but was denied. Ed Pruitt, who was sitting in the audience, asked why it was denied. Boettcher answered that it was possibly from the number of applications, or a more poverty-stricken town, or one that had more ODEQ violations. “It is very competitive,” Boettcher said. The 2019 CDBG (from INCOG) Public Hearing, the Participation Plan, the Project Selection, and the Resolution for the Mayor to Execute the Application were all approved. The last item concerned the purchase of a 2015 Dodge Charger (fully loaded) from the Kansas Highway Patrol for $18,000.00 (3 payments of $6,245.34 with 3.75 percent interest from American Heritage Bank). Trustee McGarrah asked why they needed to buy another car. Mayor Vogt said, “The motor blowed (sic) up in the car sitting out there.” When the votes were called for, all trustees voted for the purchase except Bobby McGarrah. The meeting was adjourned within 21 minutes. Then the Kellyville Public Works Authority meeting was called to order. Consent items were approved unanimously.